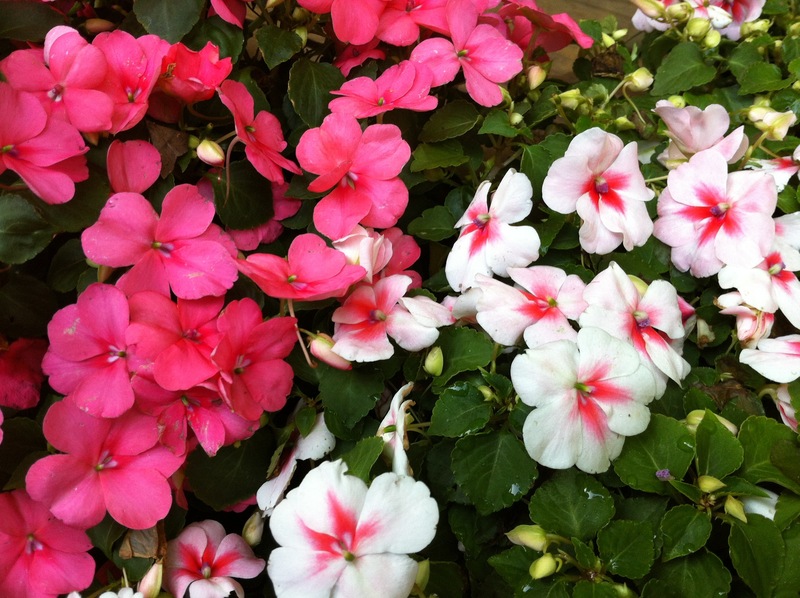 It’s wintertime and the garden is asleep — or is it? And should you be sleeping as a gardener right now? I’m certainly wide awake as it’s the perfect time to start next year’s garden planning. New seed and plant catalogs are making their way into my overstuffed mailbox. 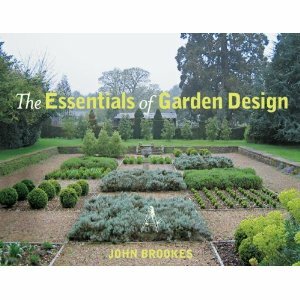 My garden planning books are beckoning from my garden library’s shelves, including my favorite garden design book from John Brookes, The Essentials of Garden Design . As a holiday gift, I received a copy of Peter J. Hatch’s “A Rich Spot of Earth”: Thomas Jefferson’s Revolutionary Garden at Monticello . It’s a book written by Peter Hatch and based upon his work at Thomas Jefferson’s Monticello estate in Charlottesville, VA. It’s not a secret that Monticello’s gardens are some of my favorites for design and simplicity as well as my favorite destination garden. 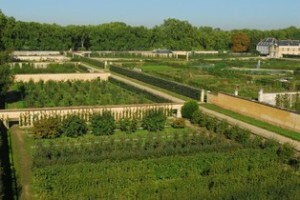 Thomas Jefferson could be America’s first real visionary gardener, having been the first known person to successfully grow a number of varieties of plants not native to the United States. 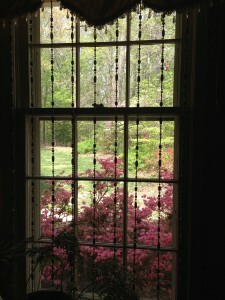 And Peter Hatch is quite the expert on Monticello and its gardens. 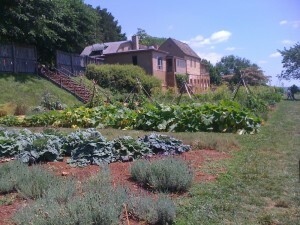 This year, I’m planning a vegetable and herb garden bed for the first time. I say “planning” because we have a large deer population in the area and I want to be sure I can protect the vegetable plants adequately. Also, the only area on the property that gets enough sun is outside of our fenced backyard and instead in the unfenced front of the property. Short of putting up a tall fence around the garden area, I needed to come up with something nicer-looking. I’m planning a decorative chicken wire enclosure that can be entered from the side. Having toured Monticello‘s gardens, I’m not sure how the local deer are kept from browsing the Monticello gardens — maybe I will find the secret in Peter Hatch’s book . Herbs can be grown in pots — a pretty collection! 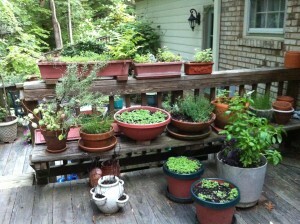 My kitchen herb garden (photo directly above) has existed in pots and containers on my back deck since we moved into this house. Over the years, the forest’s oak, maple, and tulip poplar trees have gotten taller, and there’s less and less direct sunshine coming onto the deck these days. Not enough sun at all to grow tomatoes, even in a pot. My once gorgeous New Dawn climbing rose trellis has been replaced by a pretty vigorous grapevine. The grapevine is quite prolific, even without a whole lot of sun. 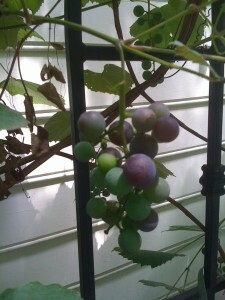 The key to the grapevine is to skimp on watering (learned that out at the Mondavi winery in Napa Valley, California). Additionally, I grow pink-flowering strawberries mostly for their looks since the squirrels get to the berries before I do. The flowers are a lovely deep pink, and believe-it-or-not, they are still blooming profusely in this cool Virginia winter! 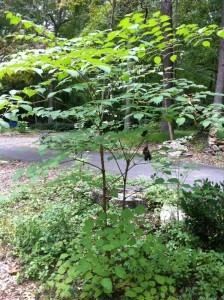 No berries forming yet, though! 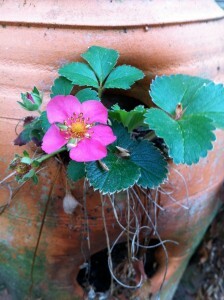 Lovely strawberry plant with pink flowers! Last year we had a number of failing oaks taken down in the front of the property…so why not plant a garden with herbs and vegetables in the new sunny area? I’ll still keep the container herb garden outside the kitchen door…yet I think it will be more fun to have a larger plot for herbs, some vegetables, and more SUN! Devil’s Walking Stick. Pretty, but not. 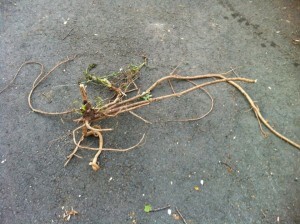 Look at the root system on this Devil’s Walking Stick!!! Aside from the Devil’s Walking Stick came some pretty creepy-looking plants called Stinkhorns that were covered with flies (see below). And they smelled terrible. 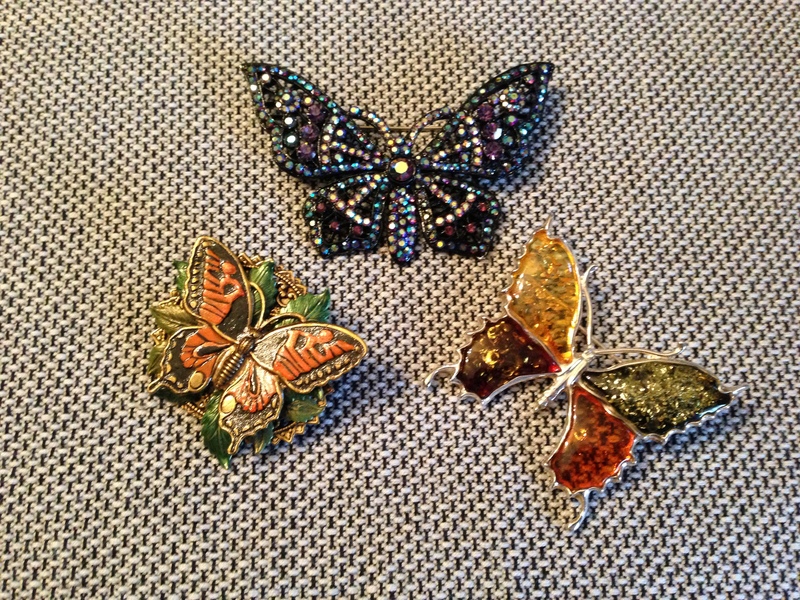 Like rotting flesh…. 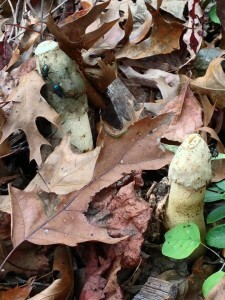 StinkHorns are well-named and they do stink. So once I’m able to figure out how to keep these two aggressive plants from appearing again, I think a raised bed will be a great solution. That way, I can line the bottom of the bed with heavy landscaping fabric and hope for the best with brand new soil! So what am I planning to plant? Hopefully, some tomatoes, peppers, squash, parsley, basil, tarragon, and cucumbers! I will add some marigolds for color and as a natural repellent for the “bad bugs.” We love to eat a lot of tomatoes in the summer and early fall, so having my own crop would be stellar. I grew tomatoes years ago at another home where I had a lot of sun. A fresh warm sun-ripened tomato straight from the stalk is such a treat! 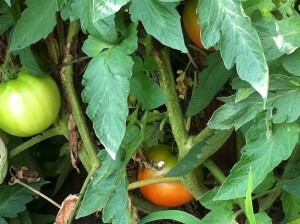 Fresh Sun-Ripened Tomatoes on the Plant! 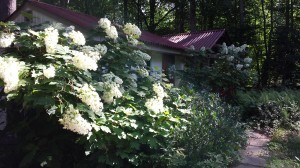 Pruning will be first on my list this year, as well as spraying a horticultural oil to smother the eggs of the lacewing bugs that emerged last summer now that my front-bed azaleas are now getting lots more sun. Some limbing up of some small decorative trees, and some pruning out of the azaleas, nandina, and Otto Luyken Laurels is needed. And a bit of mulching of chopped leaves around some areas to keep the weed population down. And what needs to be removed because it’s not growing well? I’ll be doing a bit of decision-making there, too. 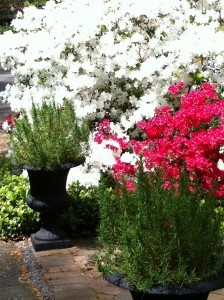 Recently, I’ve added a “Garden Design Consultation” offering to A Gardener’s Delight. 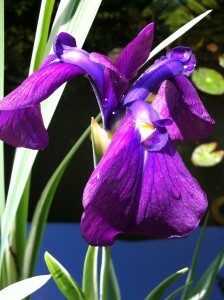 Many of you are interested in some assistance in your garden planning and design, and have requested my help. Please be sure to contact me via email at A Gardener’s Delight. 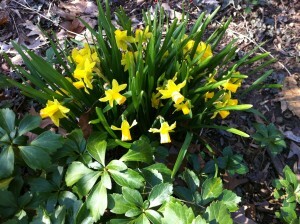 What will you be planning for your garden this year? Let me know! I’m eager to hear about your plans!